Pythium ultimum is one of the major causative agents responsible for damping off disease in cucumber plants. In the present study, the effect of potassium phosphite (KPhi) on defense response of P. ultimum-inoculated cucumber plants was investigated. Different plant growth parameters as well as chlorophyll a content were studied to evaluate the healing effects of KPhi. Furthermore, the expression pattern changes of a pathogenesis-related chitinase gene was analyzed via qPCR. Results revealed that KPhi treatment significantly increased growth parameters i.e. shoot length, diameter and mean leaf number in cucumber seedling. KPhi treatment at 1 and 4 gL-1 caused 31.37% and 94.48% increase in shoot diameter respectively compared to control plants while shoot length of plant treated with 1 and 4 gL-1 KPhi were increased 72.14% and 78.85%, respectively compared to control plants. 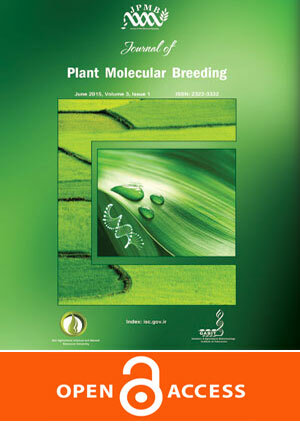 The chlorophyll a content as well as plant leaf number was significantly increased in plants treated with 1 or 4 gL-1 KPhi compared to control plants. It was interestingly revealed that KPhi application decreased Chitinase gene expression compared to control plants. The findings of the present study would be implemented for designing a controlling strategy to decrease the adverse effect of P. ultimum on cucumber plants.